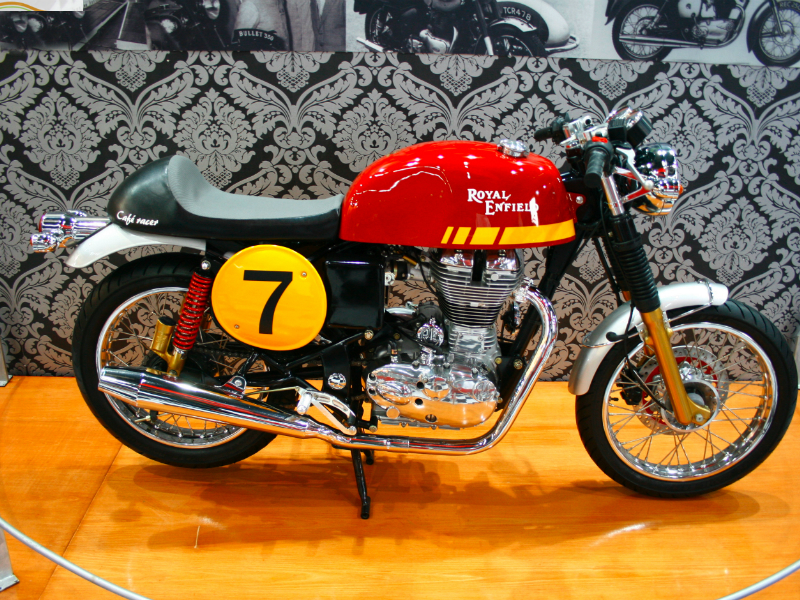 Royal Enfield Cafe Racer is the most awaited, sporty bike with unique and trendy styles. This classic vehicle was unveiled in the Auto Expo 2012 and it is expected to be available in market by the beginning of 2013. Compared to other bikes of Royal Enfield this is different in its design and hope many love this uniqueness. The best part about the motorbike is its sculpted fuel tank, chopped mudguards and other retro accessories that attract the larger crowd. The first impression of the vehicle definitely tells that it is going to win the hearts of people. With the engine displacement of 499 cc, this trendy bike is perfectly prepared for higher speed and adventurous ride. The maximum power of about 22 Bhp at 5400 rpm is produced by this efficient engine and the highest torque achieved is 41.3 Nm at 4000 rpm. This power obtained reaches the wheels of the vehicle through 6 speed cruise drive. 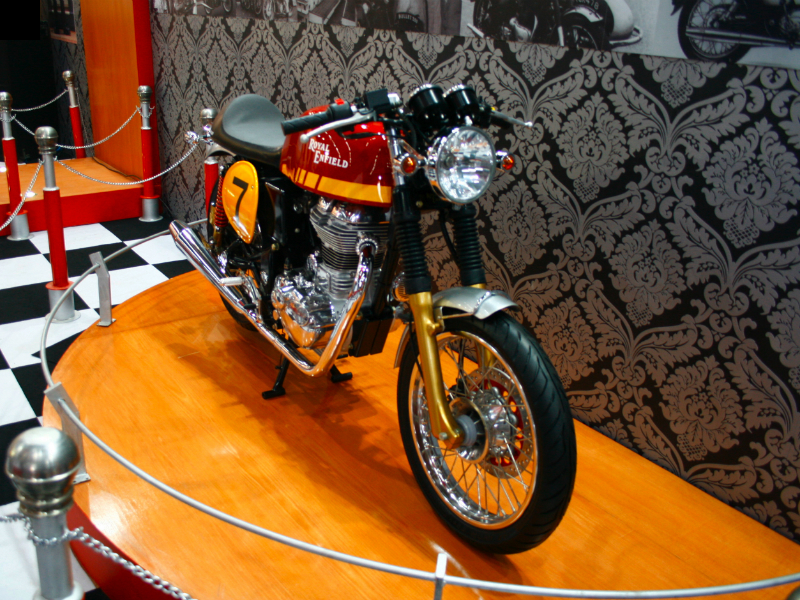 The vintage looks and classic structure of Royal Enfield Cafe Racer is sure to attract every passerby. Simple yet sophisticated appearance of the bike with the logo of Royal Enfield makes every rider more stylish and attractive. The neatly crafted fuel tank, wider leather seat, unique design of exhaust pipe, the traditional styled headlamp and trendy side view mirrors add to the overall appearance of the vehicle. With its iconic design and elegant looks the vehicle is no less than cruiser bike meant for thrilling driving experience. While ridding Cafe Racer every rider will notice the comfort and easy driving that it assures. The low seat for the rider and raised seat for pillion is the visible factor that provides greater comfort even for long distance drive. The macho bike also comes with efficient front Telescopic Hydraulic suspension and rear Twin Shock Absorbers which guarantee the smooth and problem free drive on any type of road. Further the disc brakes provided gives the complete control of vehicle to the rider under any situation. 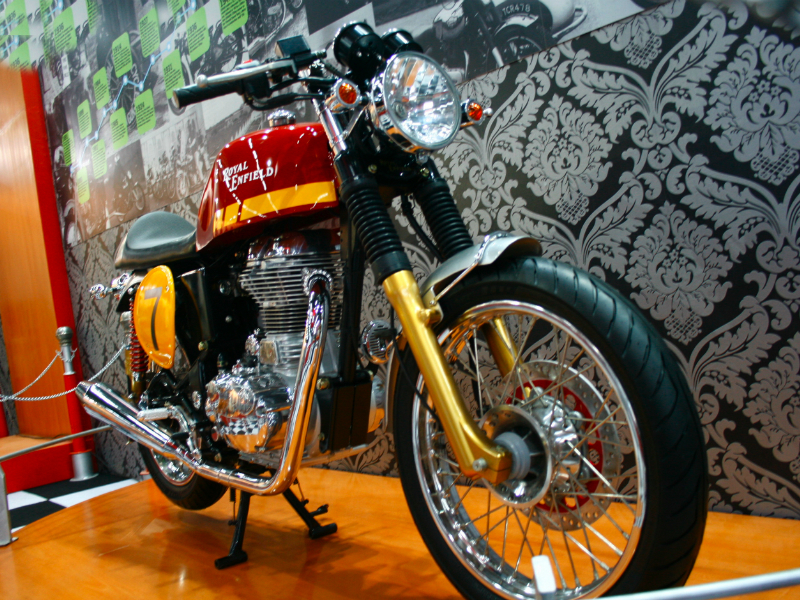 Royal Enfield Cafe Racer is a fuel efficient vehicle which assures the descent mileage of about 40 to 45 kmpl. This super stylish and classy vehicle is expected to be released in various shades but the exact detail about it is not yet known. The ex-showroom price of this vehicle is about Rs. 1,60,000.